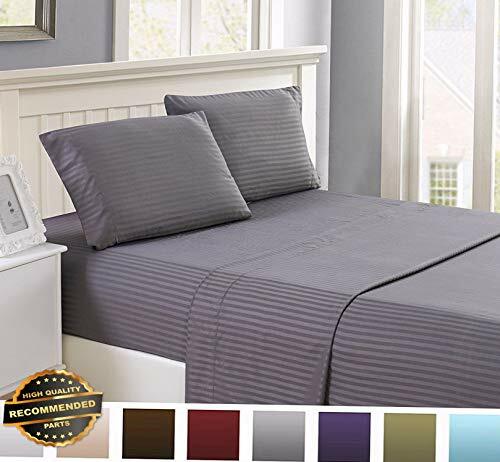 Florance Jones - Florance jones egyptian 1800 premium quality ultra soft striped bed sheet set | collection sheet set shsthr-122021475 | queen twin 3pc sheet set: 1-flat sheet 66"w x 96"l, 1-fitted sheet 39"w x 75"l and 1-standard pillowcase 20"w x 30"l twin extra long xl 3pc Sheet Set: 1-Flat Sheet 70"W x 102"L, 1-Fitted Sheet 39"W x 80"L 1-Standard Pillowcase 20"W x 30"L.
Florance Jones Egyptian 1800 Premium Quality Ultra Soft Striped Bed Sheet Set | Collection Sheet Set SHSTHR-122021475 | Queen - Queen 4pc sheet set: 1-flat sheet 92"w x 102"l, 1-fitted sheet 60"W x 80"L and 2-Standard Pillowcases 20"W x 30"L each. Florance Jones - Florance jones 6 piece: egyptian comfort 1800 count deep pocket bed sheet set | collection sheet set shsthr-122021051 | queen twin 3pc sheet set: 1-flat sheet 66"w x 96"l, 1-fitted sheet 39"w x 75"l and 1-standard pillowcase 20"w x 30"l twin extra long xl 3pc Sheet Set: 1-Flat Sheet 70"W x 102"L, 1-Fitted Sheet 39"W x 80"L 1-Standard Pillowcase 20"W x 30"L.
Queen 4pc sheet set: 1-flat sheet 92"w x 102"l, 1-fitted sheet 60"W x 80"L and 2-Standard Pillowcases 20"W x 30"L each. King 4pc sheet set: 1-flat sheet 110"w x 102"l, 1-fitted sheet 78"w x 80"L and 2-King Pillow Cases 20"W x 40"L each. Full 4pc sheet set: 1-flat sheet 80"w x 94"l, 1-fitted sheet 54"w x 75"L, and 2-Standard Pillow Cases 20"W x 30"L each. Florance Jones 6 Piece: Egyptian Comfort 1800 Count Deep Pocket Bed Sheet Set | Collection Sheet Set SHSTHR-122021051 | Queen - California king 4pc sheet set: 1-flat sheet 110"w x 102"l, 1-fitted Sheet 72"W x 84"L and 2-King Pillowcases 20"W x 40"L each. Florance Jones - King 4pc sheet set: 1-flat sheet 110"w x 102"l, 1-fitted sheet 78"w x 80"L and 2-King Pillow Cases 20"W x 40"L each. Florance jones 6 piece: egyptian comfort 1800 count deep pocket bed sheet set | collection sheet set shsthr-122021044 | queen twin 3pc sheet set: 1-flat sheet 66"w x 96"l, 1-fitted sheet 39"w x 75"l and 1-standard pillowcase 20"w x 30"l twin extra long xl 3pc Sheet Set: 1-Flat Sheet 70"W x 102"L, 1-Fitted Sheet 39"W x 80"L 1-Standard Pillowcase 20"W x 30"L.
Florance Jones 6 Piece: Egyptian Comfort 1800 Count Deep Pocket Bed Sheet Set | Collection Sheet Set SHSTHR-122021044 | Queen - California king 4pc sheet set: 1-flat sheet 110"w x 102"l, 1-fitted Sheet 72"W x 84"L and 2-King Pillowcases 20"W x 40"L each. Full 4pc sheet set: 1-flat sheet 80"w x 94"l, 1-fitted sheet 54"w x 75"L, and 2-Standard Pillow Cases 20"W x 30"L each. King 4pc sheet set: 1-flat sheet 110"w x 102"l, 1-fitted sheet 78"w x 80"L and 2-King Pillow Cases 20"W x 40"L each. California king 4pc sheet set: 1-flat sheet 110"w x 102"l, 1-fitted Sheet 72"W x 84"L and 2-King Pillowcases 20"W x 40"L each. Queen 4pc sheet set: 1-flat sheet 92"w x 102"l, 1-fitted sheet 60"W x 80"L and 2-Standard Pillowcases 20"W x 30"L each. Florance jones 6 piece: egyptian comfort 1800 count deep pocket bed sheet set | collection sheet set shsthr-122021048 | queen twin 3pc sheet set: 1-flat sheet 66"w x 96"l, 1-fitted sheet 39"w x 75"l and 1-standard pillowcase 20"w x 30"l twin extra long xl 3pc Sheet Set: 1-Flat Sheet 70"W x 102"L, 1-Fitted Sheet 39"W x 80"L 1-Standard Pillowcase 20"W x 30"L.
Queen 4pc sheet set: 1-flat sheet 92"w x 102"l, 1-fitted sheet 60"W x 80"L and 2-Standard Pillowcases 20"W x 30"L each. Full 4pc sheet set: 1-flat sheet 80"w x 94"l, 1-fitted sheet 54"w x 75"L, and 2-Standard Pillow Cases 20"W x 30"L each. Twin 3pc sheet set: 1-flat sheet 66"w x 96"l, 1-fitted sheet 39"w x 75"l and 1-standard pillowcase 20"w x 30"l twin extra long xl 3pc Sheet Set: 1-Flat Sheet 70"W x 102"L, 1-Fitted Sheet 39"W x 80"L 1-Standard Pillowcase 20"W x 30"L.
Florance Jones 6 Piece: Egyptian Comfort 1800 Count Deep Pocket Bed Sheet Set | Collection Sheet Set SHSTHR-122021048 | Queen - Queen 4pc sheet set: 1-flat sheet 92"w x 102"l, 1-fitted sheet 60"W x 80"L and 2-Standard Pillowcases 20"W x 30"L each. California king 4pc sheet set: 1-flat sheet 110"w x 102"l, 1-fitted Sheet 72"W x 84"L and 2-King Pillowcases 20"W x 40"L each. California king 4pc sheet set: 1-flat sheet 110"w x 102"l, 1-fitted Sheet 72"W x 84"L and 2-King Pillowcases 20"W x 40"L each. Florance Jones - Queen 4pc sheet set: 1-flat sheet 92"w x 102"l, 1-fitted sheet 60"W x 80"L and 2-Standard Pillowcases 20"W x 30"L each. Queen 4pc sheet set: 1-flat sheet 92"w x 102"l, 1-fitted sheet 60"W x 80"L and 2-Standard Pillowcases 20"W x 30"L each. Twin 3pc sheet set: 1-flat sheet 66"w x 96"l, 1-fitted sheet 39"w x 75"l and 1-standard pillowcase 20"w x 30"l twin extra long xl 3pc Sheet Set: 1-Flat Sheet 70"W x 102"L, 1-Fitted Sheet 39"W x 80"L 1-Standard Pillowcase 20"W x 30"L.
5 Beautiful Colors Available | Collection Sheet Set SHSTHR-122022245 | Queen - Florance Jones 6 Piece Paisley Printed Deep Pocket Bed Sheet Set - Twin 3pc sheet set: 1-flat sheet 66"w x 96"l, 1-fitted sheet 39"w x 75"l and 1-standard pillowcase 20"w x 30"l twin extra long xl 3pc Sheet Set: 1-Flat Sheet 70"W x 102"L, 1-Fitted Sheet 39"W x 80"L 1-Standard Pillowcase 20"W x 30"L. Full 4pc sheet set: 1-flat sheet 80"w x 94"l, 1-fitted sheet 54"w x 75"L, and 2-Standard Pillow Cases 20"W x 30"L each. California king 4pc sheet set: 1-flat sheet 110"w x 102"l, 1-fitted Sheet 72"W x 84"L and 2-King Pillowcases 20"W x 40"L each. Florance jones 6 piece paisley printed deep pocket bed sheet set - 5 beautiful colors available | collection sheet set shsthr-122022245 | queen twin 3pc sheet set: 1-flat sheet 66"w x 96"l, 1-fitted sheet 39"w x 75"l and 1-standard pillowcase 20"w x 30"l twin extra long xl 3pc Sheet Set: 1-Flat Sheet 70"W x 102"L, 1-Fitted Sheet 39"W x 80"L 1-Standard Pillowcase 20"W x 30"L.
Full 4pc sheet set: 1-flat sheet 80"w x 94"l, 1-fitted sheet 54"w x 75"L, and 2-Standard Pillow Cases 20"W x 30"L each. Full 4pc sheet set: 1-flat sheet 80"w x 94"l, 1-fitted sheet 54"w x 75"L, and 2-Standard Pillow Cases 20"W x 30"L each. California king 4pc sheet set: 1-flat sheet 110"w x 102"l, 1-fitted Sheet 72"W x 84"L and 2-King Pillowcases 20"W x 40"L each. Florance Jones 6 Piece: Egyptian Comfort 1800 Count Deep Pocket Bed Sheet Set | Collection Sheet Set SHSTHR-122021043 | Queen - California king 4pc sheet set: 1-flat sheet 110"w x 102"l, 1-fitted Sheet 72"W x 84"L and 2-King Pillowcases 20"W x 40"L each. King 4pc sheet set: 1-flat sheet 110"w x 102"l, 1-fitted sheet 78"w x 80"L and 2-King Pillow Cases 20"W x 40"L each. California king 4pc sheet set: 1-flat sheet 110"w x 102"l, 1-fitted Sheet 72"W x 84"L and 2-King Pillowcases 20"W x 40"L each. King 4pc sheet set: 1-flat sheet 110"w x 102"l, 1-fitted sheet 78"w x 80"L and 2-King Pillow Cases 20"W x 40"L each. King 4pc sheet set: 1-flat sheet 110"w x 102"l, 1-fitted sheet 78"w x 80"L and 2-King Pillow Cases 20"W x 40"L each. Full 4pc sheet set: 1-flat sheet 80"w x 94"l, 1-fitted sheet 54"w x 75"L, and 2-Standard Pillow Cases 20"W x 30"L each. California king 4pc sheet set: 1-flat sheet 110"w x 102"l, 1-fitted Sheet 72"W x 84"L and 2-King Pillowcases 20"W x 40"L each. Florance jones 6 piece: egyptian comfort 1800 count deep pocket bed sheet set | collection sheet set shsthr-122021053 | queen twin 3pc sheet set: 1-flat sheet 66"w x 96"l, 1-fitted sheet 39"w x 75"l and 1-standard pillowcase 20"w x 30"l twin extra long xl 3pc Sheet Set: 1-Flat Sheet 70"W x 102"L, 1-Fitted Sheet 39"W x 80"L 1-Standard Pillowcase 20"W x 30"L.
Florance Jones 6 Piece: Egyptian Comfort 1800 Count Deep Pocket Bed Sheet Set | Collection Sheet Set SHSTHR-122021053 | Queen - Full 4pc sheet set: 1-flat sheet 80"w x 94"l, 1-fitted sheet 54"w x 75"L, and 2-Standard Pillow Cases 20"W x 30"L each. Full 4pc sheet set: 1-flat sheet 80"w x 94"l, 1-fitted sheet 54"w x 75"L, and 2-Standard Pillow Cases 20"W x 30"L each. Queen 4pc sheet set: 1-flat sheet 92"w x 102"l, 1-fitted sheet 60"W x 80"L and 2-Standard Pillowcases 20"W x 30"L each. King 4pc sheet set: 1-flat sheet 110"w x 102"l, 1-fitted sheet 78"w x 80"L and 2-King Pillow Cases 20"W x 40"L each. Full 4pc sheet set: 1-flat sheet 80"w x 94"l, 1-fitted sheet 54"w x 75"L, and 2-Standard Pillow Cases 20"W x 30"L each. Twin 3pc sheet set: 1-flat sheet 66"w x 96"l, 1-fitted sheet 39"w x 75"l and 1-standard pillowcase 20"w x 30"l twin extra long xl 3pc Sheet Set: 1-Flat Sheet 70"W x 102"L, 1-Fitted Sheet 39"W x 80"L 1-Standard Pillowcase 20"W x 30"L.
Sandover - King 4pc sheet set: 1-flat sheet 110"w x 102"l, 1-fitted sheet 78"w x 80"L and 2-King Pillow Cases 20"W x 40"L each. King 4pc sheet set: 1-flat sheet 110"w x 102"l, 1-fitted sheet 78"w x 80"L and 2-King Pillow Cases 20"W x 40"L each. Queen 4pc sheet set: 1-flat sheet 92"w x 102"l, 1-fitted sheet 60"W x 80"L and 2-Standard Pillowcases 20"W x 30"L each. Sandover 6 Piece Dobby Stripe 2100 Thread Count Egyptian Quality 14 Pocket Bed Sheet Set| Size King | Style DUV-5301218201 - Sandover 6 piece dobby stripe 2100 thread count egyptian quality 14 pocket bed sheet set| size king | style duv-5301218201 twin 3pc sheet set: 1-flat sheet 66"w x 96"l, 1-fitted sheet 39"w x 75"l and 1-standard pillowcase 20"w x 30"l twin extra long xl 3pc Sheet Set: 1-Flat Sheet 70"W x 102"L, 1-Fitted Sheet 39"W x 80"L 1-Standard Pillowcase 20"W x 30"L.
King 4pc sheet set: 1-flat sheet 110"w x 102"l, 1-fitted sheet 78"w x 80"L and 2-King Pillow Cases 20"W x 40"L each. Sandover 6 piece dobby stripe 2100 thread count egyptian Quality 14 Pocket Bed Sheet Set| Size King | Style DUV-5301218201. Twin 3pc sheet set: 1-flat sheet 66"w x 96"l, 1-fitted sheet 39"w x 75"l and 1-standard pillowcase 20"w x 30"l twin extra long xl 3pc Sheet Set: 1-Flat Sheet 70"W x 102"L, 1-Fitted Sheet 39"W x 80"L 1-Standard Pillowcase 20"W x 30"L.
Florance Jones - California king 4pc sheet set: 1-flat sheet 110"w x 102"l, 1-fitted Sheet 72"W x 84"L and 2-King Pillowcases 20"W x 40"L each. Queen 4pc sheet set: 1-flat sheet 92"w x 102"l, 1-fitted sheet 60"W x 80"L and 2-Standard Pillowcases 20"W x 30"L each. Florance jones 6 piece: egyptian comfort 1800 count deep pocket bed sheet set | collection sheet set shsthr-122021049 | queen twin 3pc sheet set: 1-flat sheet 66"w x 96"l, 1-fitted sheet 39"w x 75"l and 1-standard pillowcase 20"w x 30"l twin extra long xl 3pc Sheet Set: 1-Flat Sheet 70"W x 102"L, 1-Fitted Sheet 39"W x 80"L 1-Standard Pillowcase 20"W x 30"L.
Florance Jones 6 Piece: Egyptian Comfort 1800 Count Deep Pocket Bed Sheet Set | Collection Sheet Set SHSTHR-122021049 | Queen - . California king 4pc sheet set: 1-flat sheet 110"w x 102"l, 1-fitted Sheet 72"W x 84"L and 2-King Pillowcases 20"W x 40"L each. California king 4pc sheet set: 1-flat sheet 110"w x 102"l, 1-fitted Sheet 72"W x 84"L and 2-King Pillowcases 20"W x 40"L each. Queen 4pc sheet set: 1-flat sheet 92"w x 102"l, 1-fitted sheet 60"W x 80"L and 2-Standard Pillowcases 20"W x 30"L each. Florance Jones - California king 4pc sheet set: 1-flat sheet 110"w x 102"l, 1-fitted Sheet 72"W x 84"L and 2-King Pillowcases 20"W x 40"L each. Full 4pc sheet set: 1-flat sheet 80"w x 94"l, 1-fitted sheet 54"w x 75"L, and 2-Standard Pillow Cases 20"W x 30"L each. Queen 4pc sheet set: 1-flat sheet 92"w x 102"l, 1-fitted sheet 60"W x 80"L and 2-Standard Pillowcases 20"W x 30"L each. Florance Jones 6 Piece Egyptian Comfort 1800 Thread Count Deep Pocket Bed Sheet Set - 12 Colors | Collection Sheet Set SHSTHR-122022119 | Queen - Sandover 6 piece dobby stripe 2100 thread count egyptian Quality 14 Pocket Bed Sheet Set| Size King | Style DUV-5301218201. King 4pc sheet set: 1-flat sheet 110"w x 102"l, 1-fitted sheet 78"w x 80"L and 2-King Pillow Cases 20"W x 40"L each. Queen 4pc sheet set: 1-flat sheet 92"w x 102"l, 1-fitted sheet 60"W x 80"L and 2-Standard Pillowcases 20"W x 30"L each. California king 4pc sheet set: 1-flat sheet 110"w x 102"l, 1-fitted Sheet 72"W x 84"L and 2-King Pillowcases 20"W x 40"L each. Twin 3pc sheet set: 1-flat sheet 66"w x 96"l, 1-fitted sheet 39"w x 75"l and 1-standard pillowcase 20"w x 30"l twin extra long xl 3pc Sheet Set: 1-Flat Sheet 70"W x 102"L, 1-Fitted Sheet 39"W x 80"L 1-Standard Pillowcase 20"W x 30"L.
Florance Jones - California king 4pc sheet set: 1-flat sheet 110"w x 102"l, 1-fitted Sheet 72"W x 84"L and 2-King Pillowcases 20"W x 40"L each. Full 4pc sheet set: 1-flat sheet 80"w x 94"l, 1-fitted sheet 54"w x 75"L, and 2-Standard Pillow Cases 20"W x 30"L each. Full 4pc sheet set: 1-flat sheet 80"w x 94"l, 1-fitted sheet 54"w x 75"L, and 2-Standard Pillow Cases 20"W x 30"L each. King 4pc sheet set: 1-flat sheet 110"w x 102"l, 1-fitted sheet 78"w x 80"L and 2-King Pillow Cases 20"W x 40"L each. Florance jones 6 piece paisley printed deep pocket bed sheet set - 5 beautiful colors available | collection sheet set shsthr-122022248 | queen twin 3pc sheet set: 1-flat sheet 66"w x 96"l, 1-fitted sheet 39"w x 75"l and 1-standard pillowcase 20"w x 30"l twin extra long xl 3pc Sheet Set: 1-Flat Sheet 70"W x 102"L, 1-Fitted Sheet 39"W x 80"L 1-Standard Pillowcase 20"W x 30"L.
5 Beautiful Colors Available | Collection Sheet Set SHSTHR-122022248 | Queen - Florance Jones 6 Piece Paisley Printed Deep Pocket Bed Sheet Set - Queen 4pc sheet set: 1-flat sheet 92"w x 102"l, 1-fitted sheet 60"W x 80"L and 2-Standard Pillowcases 20"W x 30"L each. Full 4pc sheet set: 1-flat sheet 80"w x 94"l, 1-fitted sheet 54"w x 75"L, and 2-Standard Pillow Cases 20"W x 30"L each. California king 4pc sheet set: 1-flat sheet 110"w x 102"l, 1-fitted Sheet 72"W x 84"L and 2-King Pillowcases 20"W x 40"L each.